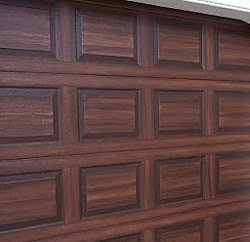 I started and completed painting a garage door to look like wood this week in Tampa. This door was facing south and I had to create shade while painting it. If I didn't the paint would have dried way to fast to manipulate to get it to look like a wood grain. I used a Sherwin Williams color called Toasty for the basecoat. This first picture shows the door after I got started with the first coat of wood grain color. That's a SW color called Java. By about 2:30 the door finally got in the shade so here's a better look at the first coat of wood graining. I got this far at the end of the first day which is quite a bit of work done for one day. When I first got there I scrubbed down the door with soap and water and rinsed it off and then dried it with rags. Taking special care to open the door and stop it at a place where I could dry the seams between each row of panels. Once dried I applied the basecoat then started the wood graining process. The next day I finished the first coat of wood graining and then started on the second coat. For the second coat I mix in black with the java color. This makes the door darker but also using two colors gives the wood graining much more depth and enhances the faux wood effect greatly. 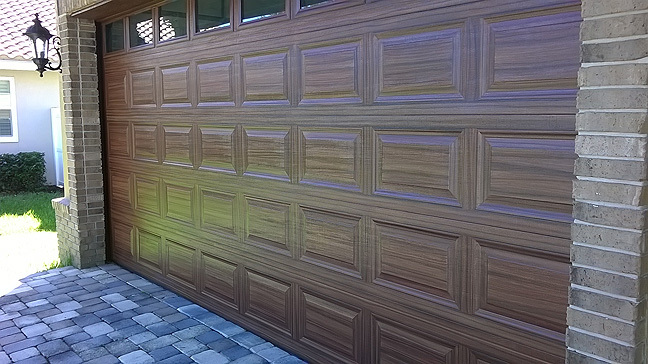 After the door was completely done with the wood grain painting I applied 2 coats of clear UV protection by using a product from Modern Masters called Master Clear. The entire job took 3 days.